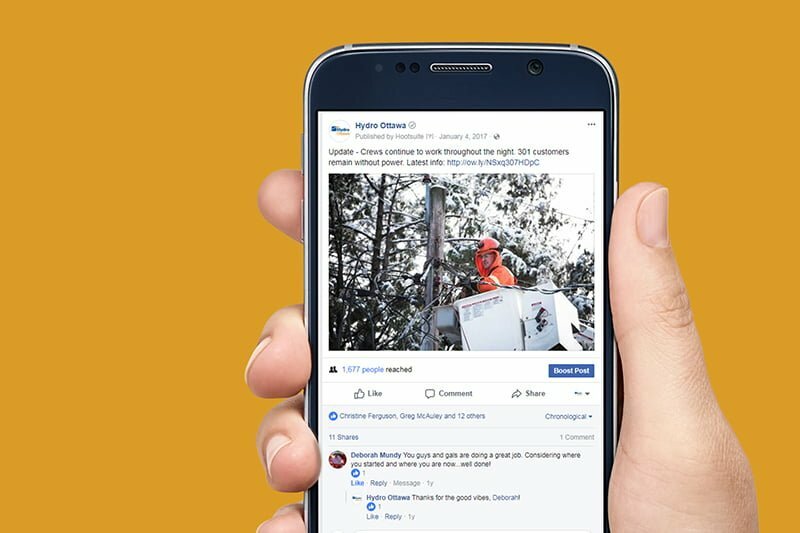 Hydro Ottawa was recognized in 2017 with by both CS Week and the Electricity Distributor’s Association for successfully driving customer engagement and raising community awareness, thanks to its comprehensive social media and video content strategy. Hydro Ottawa made use of live-streaming services and drone footage to engage customers in real time. Recognizing that customers are increasingly turning to social media for personalized, instant customer service, Hydro Ottawa developed its plan to further improve the online customer experience in 2017. 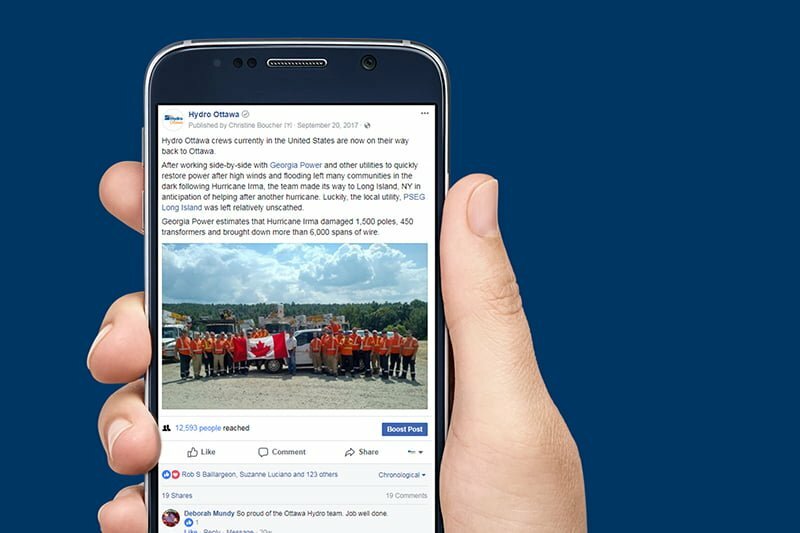 In addition to boosting its staff resources allocated to social media in 2017, Hydro Ottawa began leveraging video during major events and power outages as a persuasive communications tool that protects and preserves its brand in times of crisis. Using the GPS tracking on its fleet and regular communications with system operators, Hydro Ottawa’s Communications team can quickly dispatch a videographer to the scene of an event. Within the first hour of an outage, Hydro Ottawa is able to publish compelling video from the scene, quieting inquiries and boosting customer trust in its restoration efforts. The success is due in large part to the robust social media and video content strategy, enabling the company to create approximately 300 tailored posts every month for Facebook, Twitter, Instagram and LinkedIn, while constantly conversing with customers. The company’s social media team gathers input from across the company to ensure its content is fresh and pertinent; working closely with community influencers and the media to further extend reach. With each new video, Hydro Ottawa learns more about its customers and the type of information they find helpful – critical to tailoring its efforts and ensuring their videos are hitting the mark. Customers liked, shared or commented a whopping 51,322 times in 2017 – a 155% increase year-over-year.  Recognizing that customers are increasingly turning to social media for personalized, instant customer service, Hydro Ottawa developed its plan to further improve the online customer experience in 2017.